Who is the Ideal Candidate for Knee Liposuction in Chicago? Not everyone has beautiful knees. But knee-beauty can add elegance to the legs. For many women, getting knee liposuction is the only way to achieve a sculpted, slender appearance to the legs. Liposuction in the calves or inner thighs is often complemented by knee liposuction because it helps get rid of undesirable excess fat stores in the knee region that may interfere with a generally slender appearance in the entire leg. Fatty deposits around the knee region can be nearly impossible to get rid of using only a dietary/exercise-based solution. To add to the difficulty of getting gorgeous knees, some individuals have a genetic predisposition to having more pronounced fatty areas in the knee region. In either case, liposuction can be an effective solution to rid the patient of unwanted fat or to just to achieve more aesthetically pleasing knees. Knee liposuction is a procedure that some patients overlook. Liposuction on the knees can benefit the appearance of the whole body. Many individuals feel self-conscious about the appearance of their knees and they often feel better about themselves and the overall appearance of their legs after getting knee liposuction. The fat that gathers around the patella (knee cap) in small, localized regions can dramatically affect the appearance of the legs if left untreated. The surgeons at the Chicago Liposuction Specialty Center use a liposuction method called Water Lipo. This is a sophisticated liposuction technique that features a very safe approach to fat removal. Waterlipo™ uses a gentle stream of water pressure extract fat. The entire procedure takes only about 1-2 hours to perform and it can be done using the AwakeLipo anesthetic method. With AwakeLipo, liposuction patients receive an injection of tumescent anesthetic in the treatment area, which totally numbs the region. Then, patients take a safe, mild sedative to help them relax. 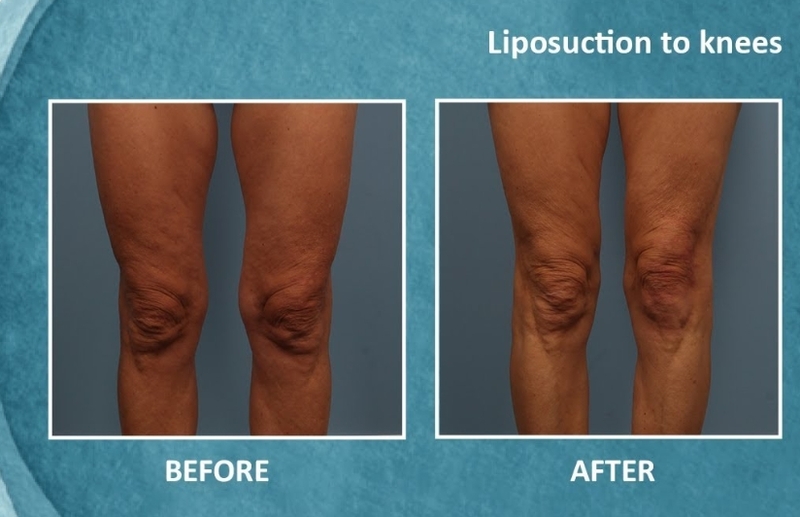 Knee liposuction performed using the Waterlipo™ liposuction technique paired with AwakeLipo allows the patient to be in complete control of themselves during the procedure. Patients can communicate with surgeons for the entire duration of the surgery. The inner knee region is the most frequently treated area. Many patients who want slender, sculpted legs don’t realize the importance of the knee region in achieving their desired cosmetic look. Waterlipo™ done on the inner knee region or on other areas of knee can improve the patient’s overall leg physique in an impressive way. In a consultation before the surgery, one of our surgeons will examine the possibility of incorporating knee liposuction into a session focusing on the legs. The Chicago Liposuction by Lift Body Center is dedicated to making sure patients get the best results from their Waterlipo™ procedure, so our surgeons review all the options with patients before the surgery is scheduled. Ideal candidates for knees liposuction can be male or female, young or old. Patients who have unwanted excess fat around their knees are all potential candidates for knee liposuction. The Chicago Liposuction by Lift Body Center takes the patient’s general health and personal goals into account before recommending any procedures. Patients who have particular illnesses requiring them to take certain medications may not be ideal candidates for knee liposuction. And patients who have life-threatening illnesses also may not be good candidates for this procedure. Aren’t taking certain medications that could interfere with lidocaine tumescent anesthesia and/or other forms of localized anesthesia. Patients should be aware that removal of fat from above the knees can cause sagging skin above the knee, and because of this, fat removal in this particular area should be combined with a knee lift for optimal results. It’s important to disclose your medical information honestly to your surgeon so that they can help you make the best treatment plan for your surgery. Most patients are candidates for knee liposuction, but a pre-op consultation can help you further understand and discuss your unique situation with a one of our doctors. Knee liposuction with Waterlipo™ requires only a short period of recovery/downtime. Waterlipo™ is a safe and gentle procedure that bypasses many of the discomforts of traditional liposuction. Traditional lipo required a longer recovery time than Waterlipo™ because in order to perform traditional liposuction surgery, general anesthesia and less gentle liposuction methods had to be used. At the Chicago Liposuction Speciality Clinic, the combination of the gentle Waterlipo™ technique and the use of AwakeLipo anesthesia method makes it possible for us to perform liposuction as an outpatient procedure. The vast majority of patients are able to leave the clinic the same day as their surgery. The complete recovery period for knee liposuction is approximately 3-4 weeks, with some patients recovering a bit more quickly or more slowly than other patients. Taking plenty of time each day to rest and relax is crucial to the recovery process after having a Waterlipo™ treatment to remove fat in the knee area. Rest gives the body a chance to focus on repairing tissues and adjusting to the new shape of the body after fat removal. Most patients can resume light daily activities within 2-3 days after surgery. Strenuous movements such as significant bending of the knees, running, and lower body exercise should be kept to a minimum for 3-4 weeks following the surgery. Knee liposuction patients should also take care to not either stand or sit for prolonged periods of time, and instead alternate regularly between sitting and standing to avoid putting undue stress on the knees during recovery. Wear the compression garment as indicated -Wearing the compression garments after liposuction surgery is an essential part of the recovery process after knees liposuction. The compression garment provides support to healing body parts. Eat nutritious foods -Nutrition is another central aspect of recovery. The body must have adequate nutrients in order to function properly in day-to-day life, and this is even more true after Waterlipo™ surgery. After liposuction, patients should observe a diet of primarily raw or steamed ingredients to preserve the vital nutrients in the food. Maintaining a healthy diet is one of the most important things a patient can do to keep their post-liposuction figure for the long-term. Drink water -Drink at least 8 glasses of water per day to make sure your body is well hydrated. Drink more water if you feel thirsty. Water helps your skin stay supple so that your body can re-adjust to your post-lipo physique. Perform gentle massage and recovery exercises -After Waterlipo™ surgery, many patients benefit from performing a light, gentle massage in the liposuction treated areas. Self-massage stimulates the body’s healing systems and diminishes swelling and discomfort. Ask your surgeon about recommendations for post-surgery exercises that may speed up the healing process. Take medications recommended or prescribed by your doctor -Our surgeons at the Chicago Liposuction by Lift Body Center may give you medications to take after the Waterlipo™ procedure. Make sure to take these medications exactly as prescribed and ask your doctor if you have any questions or doubts. During recovery from knee liposuction, patients usually experience swelling, bruising, and stiffness in the treated area. These issues gradually disappear over the course of the recovery process. But, every patient has a different experience of recovery after knee liposuction, and some individuals may experience variations in their recovery symptoms. Patients who receive Waterlipo™ recover faster and with better final results than patients who receive traditional liposuction because of Water Lipo’s updated, sophisticated medical technology. The Chicago Liposuction by Lift Body Center is dedicated to giving patients the most stunning results possible from their Waterlipo™ procedure. Our surgeons use Waterlipo™ because it is the safest and most gentle liposuction procedure currently on the market. Within the context of a consultation before the liposuction session, our surgeons and staff will examine all of the possible treatment paths available to you to help you reach the physique of your dreams. We can suggest the best course of action for you to take based off of your personal goals, medical history, and current physical figure. Our liposuction clinic offers patients affordable financing options that make knee liposuction accessible to nearly everyone. Our partners provide financing options that can work with all kinds of budgets. One of Chicago Liposuction Specialty Clinic’s financing partners, United Medical Credit, offers patients customized monthly payment plans based off of each patient’s individual financial situation. United Medical Credit’s payment plans are all free of interest fluctuations and fees. Knee liposuction at the Chicago Liposuction by Lift Body Center is done using Water Lipo, a safe, gentle, and innovative liposuction technique. Waterlipo™ is minimally invasive and performed with the AwakeLipo anesthesia method to significantly reduce the risks associated with the procedure. Waterlipo™ uses cannulas that are only 3mm wide and by harnessing the power of water pressure to dislodge and remove fat from the body, the safety profile of this procedure is much higher than with less technologically advanced surgical methods. If you’d like to learn more about Waterlipo™ safety, please visit our safety page.